A combination so special-it almost sets the standard. The blend of tea tree and Eucalyptus is universally recognized to be one of the most invigorating one. Our high-quality combination of beard oil protects the health of your hair, and sweet almond oil takes the responsibility of fixing the dry and damaged hair and reduces tangles. It is designed with the best ingredients extracted from the treasures of Mother Nature. Eucalyptus oil is extracted from the leaves of the Eucalyptus tree. It has a soothing and relaxing aroma. Eucalyptus oil has antibacterial, antiseptic, antifungal and anti-inflammatory properties. Widely used in cosmetic products it is good in keeping your skin and beard well nourished. It stimulates hair follicles and ensures a healthy growth of beard hair. Another key ingredient, tea tree oil features antifungal and antiseptic properties. It is naturally rich in water content which keeps your beard well hydrated. Apply a few drops of Silver Shine beard oil on palms. Rub to spread it evenly. Use your fingers to reach the pores of the hair. Massage for a few seconds to spread the oil thoroughly. Comb for grooming. Our Silver Shine beard oil is a combination of key essential oils that are known to support the healthy growth of beard hair while maintaining a smooth skin. Our Silver Shine beard oil does not leave a greasy effect on the skin. It is lightweight, refreshing and rejuvenating. If you are planning to grow your beard hair longer, this is exactly the product you are looking forward to. 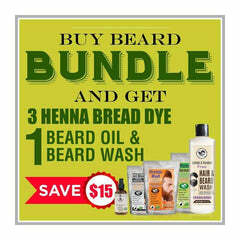 The Henna Guys is a manufacturer of beard oil that are free of harmful chemicals. Our product is absolutely safe and simple to use. You will find no additives and artificial colorings in our product. We ensure 100% satisfaction after usage of Silver Shine beard oil.